When I was a little girl, my grandma used to play the button game with my siblings, cousins and me. She would make a big production out of choosing a button from her old tin, and then she'd put the button in one hand, put her hands behind her back, and while we sat on the steps, she'd say, "Button Button, who's got the button?" We'd each guess a hand, and if we were correct, we could move up a step. This was a great game, and a memory about my grandma that I love. I have adored anything with buttons ever since. In fact, I now have my grandma's button tin, along with several large glass jars of my own which I filled with the buttons I've collected over the years. So, needless to say, anything with buttons cathes my eye. Isn't it beautiful? The vintage and new white and cream-colored buttons are perfect for winter! 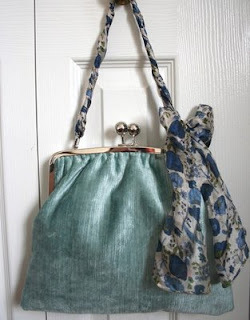 That is the Duck Egg Blue Velvet and Silk Handcrafted Metal Frame Handbag. Simply gorgeous! Would you like to win something beautiful from Mrs. Gibson's Atelier for someone on your shopping list or perhaps for yourself? Sam has generously offered ONE lucky reader of living life one day at a time a button charm bracelet in the color of the winner's choice- either, white/cream, pink, purple, green, blue, or black AND a pair of earrings made in sterling silver with buttons to match the bracelet. The value of this giveaway is over $50! • Visit Mrs. Gibson's Ateleir, and then leave a comment here telling me what item you just have to have and for whom. 3. Click on the FOLLOW THIS BLOG link on my left sidebar. Current followers count too! Leave me a comment letting me know that you already follow my blog. *Enter by 9pm (EST) on Tuesday, December 9. I love the Autumn Berry Pink Lilac Button Charm Bracelet! My sister would LOVE It! I love this site--how charming!! I subscribe to your blog as well! I'd love the Large Fine Silver Eclectic Victorian Eye Test Board Pendant Necklace for myself!! I love the Sterling Silver Candy Pink Flower Crystal Charm Bracelet. So pretty! I love the duck egg and cream tartan clutch!!!!!! LOVE IT!!! Great shop!!! I love this shop! My dilemma is which item I like best. I would like to get the Romantic Gypsy Money Coin Charm Bracelet 1938 Threepenny Piece 1882 Belgium Cent for my sister. She loves to travel and her husband is from India. I love the Swarovski Crystal Absinthe Sterling Silver Charm Bracelet (among other items) for myself. Thank you for the opportunity. I'm also a subscriber. Thanks again. I have lots of old buttons too! She should offer custom work with "family heirloom buttons". I would love to win the Purple and Lilac New Season Button Charm Bracelet and give it to my mom for Christmas, she would be delighted ! I love the Victorian Style Burgundy Metal Frame Velvet Handbag. love the Decadent Pink Bodice Ripping Romance Novel Button Charm Bracelet They're all really beautiful. I think My husbands grandmother would really enjoy it! My favorite item is the Sterling Silver Purple Lilac Dusky Glass Bead and Crystal Hoop Earrings, and they would be all for ME! Love the colors and love hoop earrings! Wow! The Rose Tinted Swarovski Crystal Sterling Silver Charm Bracelet is simply beautiful! I would love to get it for my mom! I have one of Mrs. Gibson's bracelets and I love it! 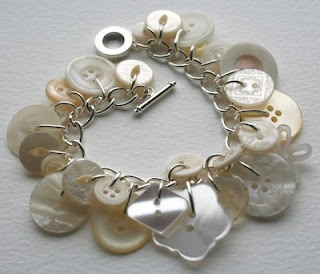 I'm now in love with a pink button bracelet she has listed in her shop. AND I'm going to follow your blog right now! I think the Sterling Silver Candy Pink Flower Crystal Charm Bracelet is so beautiful! I would love to give that to my granddaughter. Thank you so much! my sisters would like money travels! I would like to get the Vintage Buried Treasure Silver Heart Locket for my best friend! and I am a follower, thanks again. liked the coin purse with the duck egg blue lining and the lucky chair keyring, thanks so much., I'd like them for myself! My sister would love the navy and cream midnight sky button charm! Her favorite color is blue! I subscribe via reader too!